On December 25th 2013 we witnessed Matt Smith’s final hurrah as The Doctor. The Time of The Doctor picks up right where the 50th anniversary special (The Day of the Doctor) left off. The newfound knowledge of the survival of Galifrey lifts a huge weight off The Doctor’s shoulders. That, along with the epic trailer of said episode that was shown, undoubtedly sets the stage for a sending off of seemingly epic proportions. Unfortunately, it pains me to say that the ‘Eleventh’ Doctor’s final farewell falls tremendously short of expectations. The proportions were epic, but perhaps too much so. Moffat seemed to come to the conclusion that it would take the combined efforts of almost EVERY EVIL ALIEN RACE in his Doctor Who mythos to even have a chance of killing the Eleventh. Moffat even throws in the impromptu introduction of Tasha Lem, the freaking leader of the Church of the Silence! I do not understand why a good chunk of the episode is spent teaching us about the inner workings of the Silence, an enemy we haven’t seen since the sixth season, where I’m sure one would have been more welcome. My main issue with The Time of The Doctor is time itself. Whist Moffat has shown before that he has the ability to make great hour-long television, The Time of The Doctor was simply begging to be a two-part special. The Tenth Doctor’s The End of Time is a good example of a well executed sending off, with several specials leading up to the final two-part ‘Movie’ that featured the return of The Master. A central antagonist would have helped The Time of The Doctor, but ultimately more time would have surely helped Moffat give Matt Smith’s final show that much-needed ‘Oomph’ which is present is so many of his previous outings. The Time of The Doctor is by no means a bad episode. It just isn’t a great one. The episode proves that Steven Moffat is human, that he too can fail to deliver on expectations. Perhaps the fall of the Eleventh is meant not to overshadow what has otherwise been a “Hall of Fame’ like outing for this particular Doctor. A new Doctor is on the horizon, and out of the chaos that was The Time of The Doctor, comes a fresh start. Who knows how many new faces we’ll see piloting the TARDIS in the seasons to come? After three fantastic seasons its time to say goodbye to ‘Mr. Cool’ and his bowtie. Matt Smith was for many, the first Doctor they had the pleasure of seeing, and his run helped make Doctor Who the worldwide phenomenon it is today. 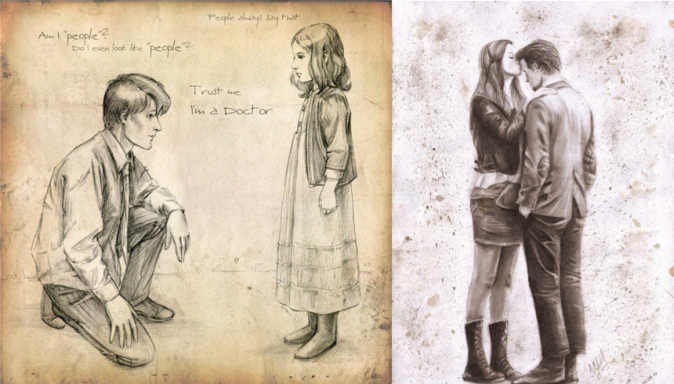 Farewell Raggedy Man, you will be missed. An ending is also a new beginning. This entry was posted in 50th Anniversary Special, BBC, christmas special, church of silence, Comic Book, Day of the Doctor, Franco Romualdez, Galifrey, Matt Smith, Movie Reviews, raggedy man, steven moffat, TARDIS, tasha lem, the master, time of the doctor, Whovian By Design and tagged 50th Anniversary Special, bbc, christmas special, church of silence, Day of the Doctor, doctor who, Doctor Who Christmas Special, Franco Romualdez, Galifrey, Matt Smith, raggedy man, steven moffat, TARDIS, tasha lem, Tenth Doctor, the master, The Time of The Doctor, time of the doctor, Whovian By Design. Bookmark the permalink.